Sweet Spot was a fun brand when it was around. Although after Upper Deck started to use that manufactured baseball leather near the end it took a nose dive. Mainly because the autographs would bleed heavily into that material. Some of those autographs were barely visible straight from the pack. The regular baseball leather they started out with doesn’t bleed as much. Just to be safe, I keep all of my Sweet Spot autographs in the dark no matter what material Upper Deck used. Especially when it comes to those cards signed in red ink. I enjoy Sweet Spot Classic from 2004 and 2005. 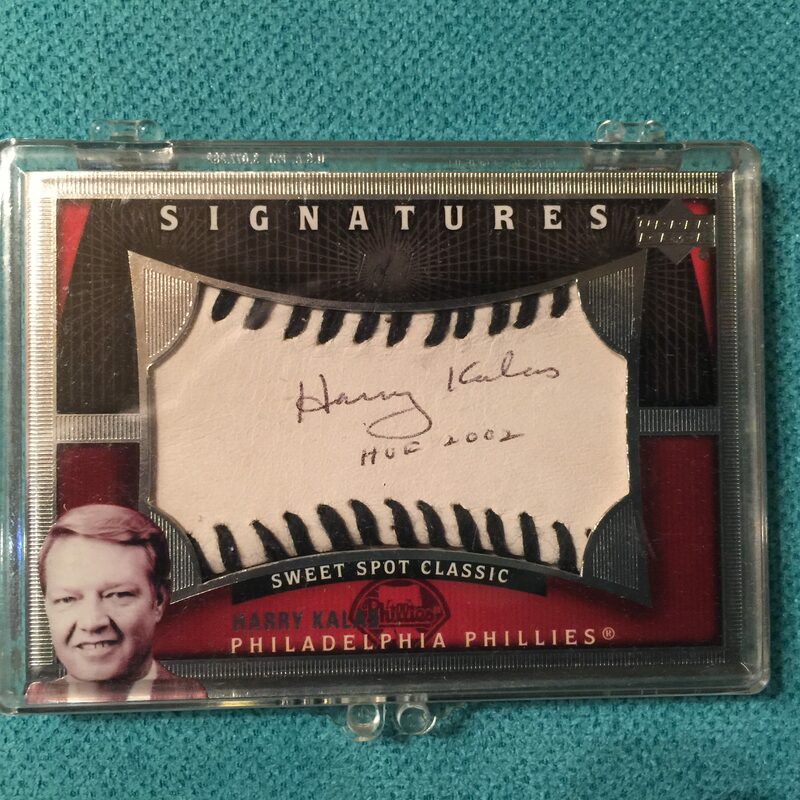 Phillies legendary broadcaster, Harry Kalas, has autographs in both sets. If you’ve been following Sports Card Info, you know that I’m a big Harry Kalas collector. He doesn’t have many cards. The ones he does have rarely show up. When I do get to add something to my collection its a big deal. The last Sweet Spot Classic card I need of his is the Black Stitch Auto #’ed 1/1 from 2005. A fellow collector stumbled upon my blog and noticed this card on my want list. 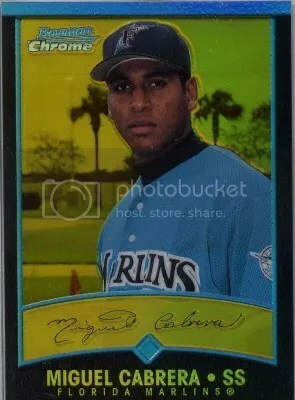 Twelve years ago, this collector just happened to be the person to pull it from a pack. Its been sitting in their collection ever since. I thought it had been lost forever or still stuck in a box somewhere. The last I heard, this collector was thinking about selling it. That was about a month ago, and nothing has surfaced on eBay. I have a feeling its worth quite a bit considering the base version recently sold for $130. Even though I don’t own this card… yet, I wanted to show it off. Phillies and/or Sweet Spot fans should appreciate seeing it. 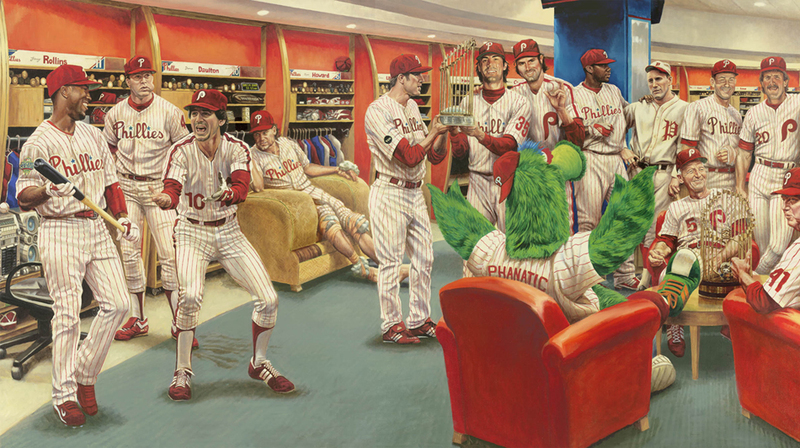 Jaime Cooper’s Phillies “Dream Scene” masterpiece that hangs inside the Diamond Club at Citizens Bank Park is a must see when visiting. 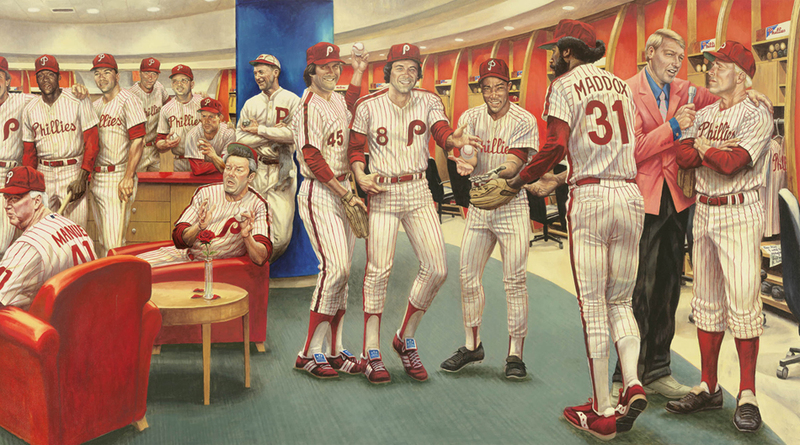 The 14′ painting shows the best Phillies players from various generations all hanging out in the locker room. The only player not seen in physical form is Pete Rose. He was left out and is represented in spirit by having a rose sitting on the table. 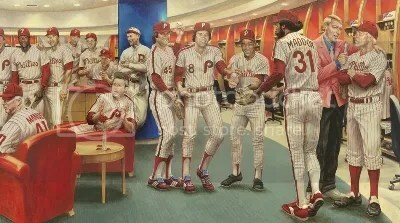 Recently some Phillies “Dream Scene” concept art popped-up for sale which you can see includes Pete Rose. Rose can be seen off to the right and standing in front of Gary Maddox. Unfortunately Rose didn’t make the final cut. Too bad. I think he deserves to be in there. This isn’t the only difference, but it is the most significant. Larry Bowa is standing in a different position, and so is Paul “Pope” Owens. I’m sure there are even more differences if you sat and looked at it longer. 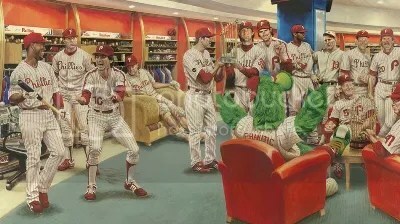 The Phillies 2012 season has officially come to an end. They finished the year 81-81 which seemed like a dream a few months ago. If you’ve been reading Sports Card Info for awhile, you know what a fan I am of the Phillies former broadcaster Harry Kalas. Harry Kalas doesn’t have a ton of cards, which in one way makes him easy to collect. But then on the other hand the cards he does have rarely show up for sale and when they do be prepared to open your wallets. 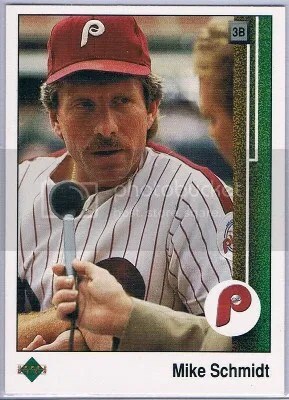 At first glance, it looks like your standard Mike Schmidt 1989 Upper Deck #407 base card. Look harder. Who is that interviewing Schmidt? It sure looks like Harry Kalas to me. ’89 Upper Deck Baseball has been released for 23 years, and its still shooting out surprises. You have to admit this error is pretty ironic. Peyton Manning and Randy Moss were two of the biggest rookies in the 1998 Draft Class. I have to believe that this error was made on purpose, just to bring attention to the brand. What are the odds that this would be an accident? Of all the rookies, it had to happen to these two. I would think differently if it were two no name rookies, but that’s just not the case. 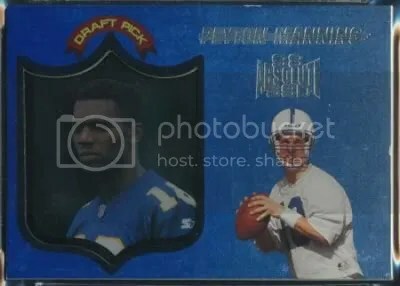 With Peyton Manning shopping around for a new team, and Randy Moss just signing with the 49ers, it makes perfect sense for this card to surface. This error recently sold for $156.00. I remember when 1998 Absolute SSD was released. These cards with the see-through inset were quite popular. This wasn’t the first time cards had a see-through element to them, but when compared to all the others I enjoy these the most. They remind me of a very early version of the Shadow Box card. They are very condition sensitive and can easily be damaged. Its not uncommon to find them with chipped edges.